Yes, this is a brave and luminous volume about living with – then dying – from cancer. 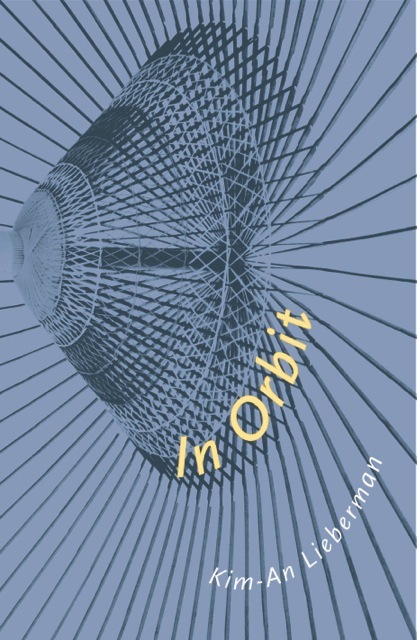 In Orbit does not, however, follow an orthodox trajectory – the poems resist the labels of cancer patient or invalid. With raw beauty, In Orbit breathes more life than illness into its lines: We read poems titled, “Chemotherapy Teaching Sheet” (51), “Oncology Primer” (44), and “Cardiac Scan with Backlit Ceiling Mural” (49), yet encounter Seattle blossoming “in a thousand different languages, flowering” (29). the immigrant gardens are blooming. bamboo shoots rising through layers of clay. bok choy bursts yellow, peppers clatter down the vine. watch the cars on I-5 burn a river of light. Kim-An Lieberman received a diagnosis of late-stage gastric cancer in her late thirties. Loving wife and mother of three, Lieberman’s journey on earth suddenly launched into orbit: “I have been injected with a vial / of my own blood, taken and tagged / with some glowing ore, to show on screen / the bare pathways of my literal heart” (49). The start of the collection weaves her Vietnamese heritage, using a double-helix as a figure of inheritance, generational stories, and detailed lyric narrative, while the final poems of her collection allude to terminal illness while her spirit as a weaver of imagery persists in truth-telling, “sharper and straighter than flame” (19). Those of us who fondly remember her love of the environment and of living creatures, who rejoice with the exuberance of her dear children (“Returning to the Children after a Week Away,”), will recognize the endearing spirit of these poems. New readers of Lieberman’s work will find in these pages much to admire in their blazing honesty and beautiful resilience. and because one more step means I never was. In the last two-thirds of the collection, Lieberman challenges us to look beyond the clinical lexicon of living with DHGC (diffuse hereditary gastric cancer), a hereditary condition, to its individual reality. Lieberman writes of an uncertain yet perpetual present – ceaseless time flowing in in rooms without clocks, or calendars tossed away at the cut-and-dry advice of professionals: “Let me be clear. Cancer is no one’s poetic dreamscape. / . . . We are told to get our affairs in order / and to stop buying calendars” (56). The journey asks my flesh for a map. Cities exploding, cell against cell. Although burned and broken in the flesh – compared to a battlefield — her spirit is fierce, and “Ars Poetica” affirms the power of life as vision through imaginative will in the poem: “This actually is my life flashing before your eyes” (56). These poems moved me sadly and profoundly – from memories, over a decade ago, of a radiant Kim-An Lieberman in our years at Berkeley, a time we visited the farmer’s market and Kim-An asked the marmalade woman if she wanted Meyer lemons, or a box of dark chocolates Kim-An once brought me, her avid vegetarianism, her gorgeous collection of scarves, her passion for social issues, especially animal rights, gender equity, and environmentalism — and loved ones who are cancer survivors or who did not live, and friends whose lives were turned upside-down by a telephone call about a pathology lab result. Almost none were in their thirties, and only one was Kim-An. This is to say, reading this collection hurts. It is a bittersweet vial of tears as Kim-An sends a blessing of light into the future – namely, the lives of her beloved children. for now, let her world shimmer. My immense gratitude is due to Kim-An Lieberman for her fortitude, her inspiration, her intelligence made even more brilliant by a loving heart, her lyric poems of unbounded existence with a measured eye: “My cells and not my cells. / My heart itself another sort of cell” (49). Even while her life sailed into orbit — a place those of us left behind have yet to see — she made this planet, a world of beauty and savagery, a better place for all. Karen An-hwei Lee is the author of Phyla of Joy (Tupelo 2012), Ardor (Tupelo 2008) and In Medias Res (Sarabande 2004), winner of the Norma Farber First Book Award. Lee also wrote two chapbooks, God’s One Hundred Promises (Swan Scythe 2002) and What the Sea Earns for a Living (Quaci Press 2014). Her book of literary criticism, Anglophone Literatures in the Asian Diaspora: Literary Transnationalism and Translingual Migrations (Cambria, 2013), was selected for the Cambria Sinophone World Series. She earned an M.F.A. from Brown University and Ph.D. in English from the University of California, Berkeley. The recipient of a National Endowment for the Arts Grant, she serves as Full Professor of English and Chair at a small liberal arts college in greater Los Angeles, where she is also a novice harpist. Lee is a member of the National Book Critics Circle.